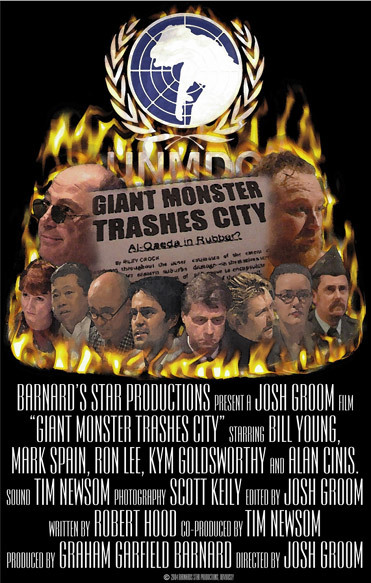 This film came about when producer Graham Garfield Barnard read Robert Hood's story "Watching a Giant Monster Trash a City" and decided that making a short film out of it would be a suitably challenging task and one that appealed to his particular sense of cinematic masochism. "Having no experience actually making films (though plenty watching them)," Hood commented, "I had no idea what an incredible effort this would entail." "Over the next many months, I found out that even making a seven-minute film was a grueling experience requiring much commitment and sacrifice on the part of the filmmakers. "Not that I was the one under pressure. I just fiddled with the script. My experience was an almost completely vicarious one. Garfield Barnard did all the base-level planning and manipulating and cajoling and organising. He then gathered together a team of friends and acquaintances with expertise in filmmaking to undertake the subsequent acts of creative expressionism." Barnard attracted an impressive team of actors to star in the film, including Bill Young (who has been in such auspicious genre films as Turkey Shoot, Body Melt and The Matrix), Mark Spain (Harlequin and Mad Max Beyond Thunderdome), Mark Cinis (Dark City) and Kym Goldsworthy (The Roly Poly Man). "I turned up for the first day of the shoot," Hood said, "and was blown away by how much effort had gone into the preparations -- and how classy the props, the actors and the technical people really were. I had expected something fairly low-key, but it was much more than that." The resulting film is an ironic excursion into daikaiju lore and what can be made of it -- one that even features a few seconds of giant-monster destruction and some decent pyrotechnics. Will it ever appear on DVD? Yes. It's coming. More news soon. Anyone seeking further information on the film or wishing to organise screenings may contact Barnard's Star Productions by email at garfield@viper.net.au. the original story upon which the film was based is available on-line. Just click on the icon below. The anthology is to be published by Agog! Press.